Thump delivers 1000W of power and the class-leading, chest-thumping low end you deserve. Get more control over your sound using Thump's 3-band EQ with sweepable mid. 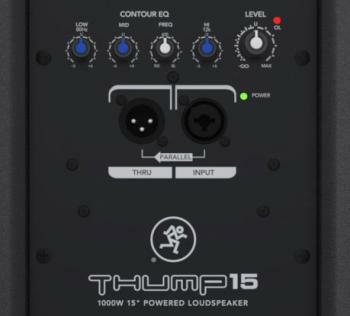 Only the Mackie Thump15 delivers the class-leading, chest-thumping low end you deserve. With 1000W of power, the Thump15 provides the high output you need in a package that's tough, lightweight and portable. Designed by the world's leader in portable live sound, Thump15 offers a 3-band EQ perfect for acoustic and vocal-only applications. And with a rugged enclosure and robust system protection, you're more than ready for your next show. Delivering real-world power levels, application flexibility and class-leading bass response, you can be confident that the Thump15 offers the best performance for your money. 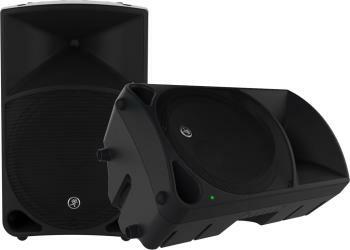 The gig-ready, high-output design of the Thump15 is powered by ultra-efficient Class-D amplification. Class-D amps run cool even when pushed hard, minimizing the risk of thermal shutdown in hot venues and outdoor events. All-new custom-designed drivers include a high-output 15" woofer and premium 1.4" titanium dome HF driver. And, with the new dynamic bass response technology, you get amazing lows at all volumes. In true Mackie tradition, we've packed the Thump15 with a ton of sound-enhancing processing and tools, so you don't have to buy and use complicated (and expensive) external processors. A precision 2-way crossover effectively splits highs and lows to the right speaker, for optimum imaging and clarity. Additional phase correction and driver time alignment further aids definition and coherency. There's also robust system protection in place including signal limiting that can protect against speaker damage when things get pushed a little too hard. Thump's rugged polypropylene cabinet is designed for heavy use, protected against the scuffs, tears and cracks that inferior cabs can suffer. And, of course, portability is key. At only 33 lbs. 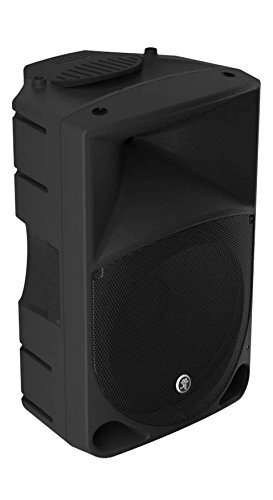 (15.1 kg), Thump15 is easily one of the most lightweight portable loudspeakers available. Thump15 features the only 3-band EQ in its class, including a sweepable mid control for added precision. You can even directly connect a mic for simple vocal-only applications… no mixer needed. A compact loudspeaker is often used for many things, so the Thump15 is designed for use on a speaker tripod or atop a subwoofer. The angled cabinet design also makes it the perfect stage monitor when placed on the floor. Get Louder. Get Lower. Mackie Thump Powered Loudspeakers.